At Alberti's Window, Monica Bowen posted a remarkable summary of the curious portrait known as Boy bitten by a lizard. 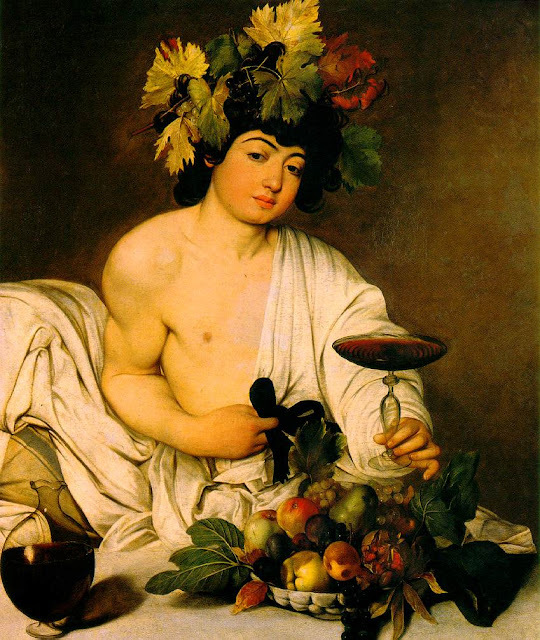 Her fascinating post explores some of the leading theories on the painting, and whether inferences made about Caravaggio's homosexuality are evident in the work. To quote art critic and documentarian Waldemar Januszczak, the topic of Caravaggio's homosexuality is a "wasp's nest" - best left alone. It is definitely one of the most contentious issues surrounding Caravaggio - particularly when discussing him on Italian shores. The following clip is a snippet from the amazing Every Picture Tells A Story series presented by Waldemar Januszczak. In this episode, he explores Caravaggio's inspiration for the symbols in the painting, drawing on both classical and Biblical sources. If you enjoyed this clip, I definitely recommend tracking down the rest of this episode, and the series - which is directly available from ZCZ Films. I personally enjoy these earlier works of Caravaggio's. They are playful and have that intoxicating mixture of antiquity and the contemporary world they were created for. Considering the heavier, spiritual and morbid themes of Caravaggio's later life and work, I am glad some of these earlier works survive. One thing that is often overlooked is the boy's hand position is evoking a gesture commonly used in the Mediterranean. The modern meaning is analogous to what we associate to the middle finger today, but the hand position is identical to the way it is depicted in the painting. Older generations however used this gesture to ward off evil eye. In this instance, the painting can be read as a totem of good fortune, just like the evil eye charms you commonly see in the Southern Mediterranean, North Africa and the Middle East. The lizard in this scenario becomes the biting gossip and envy that is seen as the cause of evil eye. Hence, being vain or showy like the young boy/bacchic figure depicted acts a warning, encouraging temperance at this level of interpretation as well. In researching digitus impudicus, I was delighted to see the evil eye reference mentioned. Talismanic items to ward off evil eye are depictions of eyes often made of blue (or green) glass or beads. For a wonderful article on evil eye in antiquity - please read Happiness lives here - Fascinated by the evil eye at Vicki Leon's blog. We know that Mario Minniti was with Caravaggio at the time, and some argue is the model in the painting. As a Sicilian, this gesture would have been well known to him in particular - as this gesture and the evil eye tradition was, and still is quite strong in the southern parts of Italy. This has also reminded me of a related hand gesture, the sign of the horns, which has been popularised by musicians in the modern era - but was first used by Ronnie James Dio, member of the pioneering rock/metal group Black Sabbath. He has been interviewed about it many times, and states that it was commonly used by his Italian family members, particularly his grandmother who was originally from Sicily. 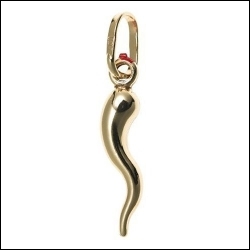 Italians call this symbol corni (horns) or maloi/malocchio - which itself means 'evil eye'. If anyone is aware of further scholarship on Boy Bitten by A Lizard that describes it as a talismanic work evoking the Mediterranean evil eye suspicion, please let me know. Thanks for the link to my post! This is an interesting painting, isn't it? The middle finger argument is interesting. I wanted to stress, though, that the middle finger can represent sexuality without being a reference to homosexuality or homo-eroticism. In fact, the middle finger in Boy Bitten by a Lizard was first discussed by Leonardo J. Slatkes in 1975, in an article which he wrote to argue against any element of homosexuality. (See Slatkes, "Caravaggio's 'Boy Bitten by a Lizard,'" Print Review 5 (1975): 149-153.) Slatkes sees the "impudent finger" as strictly a reference to sexuality and lust. He interprets the whole painting as symbolic, and examines many elements as being related to the iconographic tradition in Northern art. Cheers M! I've been staring at that hand position for a while since reading your original post - it looked extremely familiar. I followed my hunch and arrived at a new reading of the painting I had not considered before! I have edited the post with this new information, I invite anyone to please let me know if they have read something similar elsewhere about this painting as an evil eye talisman. Fascinating! Really enjoyed this and the film too. Who was the gentleman who was demonstrating how the finger was used in ancient (Renaissance?) times to point to a homosexual? I've never heard this before and I'm curious where one would learn such a thing or whether it was conjecture. Love your posts--always learn/see something new! Interesting idea about the evil eye gesture, Hasan. I've never heard anyone come up with that interpretation before. Claim it as your own! John Gash associated the lizard with envy in his 1980 book on Caravaggio (he wrote that the lizard is a creature which "displays the signs of envy and of crooked guile") but that is the closest thing to your argument (of which I am aware). It is interesting to note, though, that the earliest written record of "Boy Bitten by a Lizard" was by Gulio Mancini ("Considerazione sulla Pittura" 1617-1621). 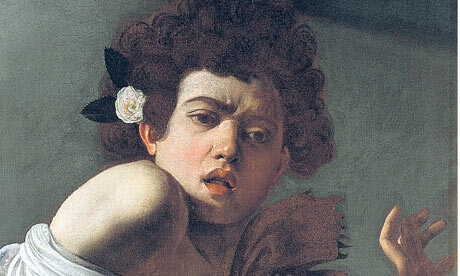 Mancini writes that Caravaggio “painted for sale” a picture of a boy who cries out because he has been bitten by a lizard “that he holds in his hand” (my emphasis). It seems like Mancini may have forgotten the details of this painting, or perhaps he never saw the painting himself and was misinformed about the position of the lizard (since the lizard is not actually in the boy's hand). However, this also makes me wonder about the gesture that you have mentioned. If Mancini did actually see this painting, the gesture (and its cultural associations) didn't have enough impact for him to remember it in his description. @Vicky! I loved that you used the word 'fascinating'! The phallic symbols used by the Romans were called fascimum - due to their rod like appearance, and similarity to the word fascinare which (apparently) means to cast a spell! This is where we get the word 'fascinate' from. The chap you mention is ex-Oxford researcher Peter Collet, who has written on, and commonly appears on TV as a body language expert. His Book of Tells is the most well known, but you can also find clips on YouTube by searching for his name. 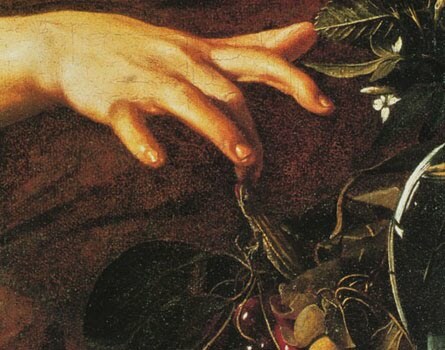 If it were a photo of that position - maybe, but Caravaggio had to carefully paint that very specific posture of the fingers, it cannot be that random, surely! This also reminded me of a similar hand gesture that we are all familiar with due to its appropriation by modern musicians - but it also has its roots in the Southern Mediterranean! I've added that to the post as well. Congratulations H Nayazi! Your post was selected to be included in the November issue of the Art History Carnival. Cheers M :) I love the AH Blog Carnival, a great new blog always turns up! !